No doubt filing for bankruptcy is a huge decision. But sometimes that decision is helped along by issues that are beyond our control, like when we have an accident or develop an illness that leads to huge medical bills. Bankruptcy is often seen as a failing, or subject to moral judgment. But consider the US Constitution, which gives Congress the authority to establish “uniform laws on the subject of bankruptcy throughout the United States. (Article 1, Section 8, Clause 4). Even our founding fathers recognized the need for a mechanism to help people get out from under unmanageable debt and get a fresh start to move forward and become contributing members of society. In short, bankruptcy is good for the economy. A medical bankruptcy has no strict definition. Most people think of a medical bankruptcy as one filed to get rid of (or discharge) hospital and doctor bills, which for many people amount to thousands and thousands of dollars. But it can go deeper than that. Even if the debtor’s medical bills are covered, he could experience a medical bankruptcy because of loss of income when he has to take off work after an accident or illness. A major factor in the decision to file bankruptcy for many people is overwhelming medical debt. Certainly, some people are left with staggering medical debt because they don’t have health insurance. But it isn’t just the uninsured who find themselves backed into a financial corner. Medical insurance premiums are staggeringly high. Even policies available through the Affordable Care Act marketplace are affordable only because the insurance companies have set policy deductibles so high. It isn’t unusual for the deductible to be $10,000 a person or $20,000 a family, or more. This is how much you’ll have to pay out of pocket before the insurance company covers any other medical bills. From the bankruptcy paperwork, it’s difficult to discern whether any one case is a medical bankruptcy. Nowhere in the bankruptcy paperwork is the debtor (the person who files a bankruptcy case) required to state the reason for the bankruptcy filing. The debtor is required to list all debts, including medical bills. Looking at the list of creditors and the balances on the accounts will give us a clue if the debts are numerous and large. The trustee, at the debtor’s meeting of creditors, will often ask the debtor what led to the decision to file bankruptcy. 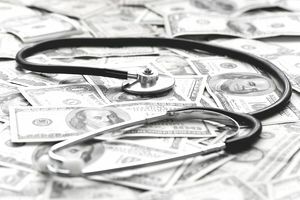 In one often quoted study conducted by Senator Elizabeth Warren while she was a professor at Harvard Law School, medical bills were a factor in more than 50 percent of bankruptcy cases. Other studies have produced similar results while still more studies have pegged the number closer to 25 percent. A study published by Nerdwallet Health in 2014 found that medical bills are expected to be the single most important contributing factor, even more so than credit card or mortgage debt. Either way, the amount of medical debt discharged in bankruptcy cases in the United States each year is in the hundreds of millions. Fortunately, that debt is dischargeable in both a Chapter 7 straight bankruptcy and a Chapter 13 repayment plan. You may have to qualify for a Chapter 7 case under the means test, which is a calculation using your income and expenses to determine if you can afford to make payments. If you don't pass the means test, you can file a Chapter 13 case and pay some of your debt over three to five years. Do I Really Need to File Bankruptcy to Eliminate Medical Debt? Medical creditors are often easier to work with than other creditors with other types of debt. Medical accounts will stay with the doctor’s or hospital’s billing department as long as possible before they’re shipped off to a collector. Many times your doctor or other health provider will agree to take a very small amount each month, even $5 or $10. In some cases, especially if it’s a public hospital or doctor for a Medicare of Medicaid patient, the providers won’t even bother to do much beyond sending a bill. Medical creditors seldom belong to credit reporting agencies, so the debt isn’t likely to affect your credit score much. You may be safe trying to work out payment arrangements with your medical creditors instead of filing a bankruptcy case. You won’t lose much by trying, but if you can’t get any satisfaction from working with your creditors, either Chapter 7 or Chapter 13 will be there to take care of it for you.